Norwegian and its decade-long corporate social responsibility partner, UNICEF, sent a Boeing 787-9 aircraft filled with emergency aid for children in need in Yemen this morning. 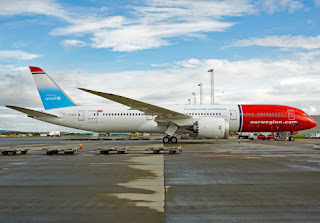 The aircraft used for this mission was delivered to Norwegian just last week and is the airline’s first Dreamliner aircraft with a UNICEF livery. The aircraft’s entire cargo belly is filled with emergency aid. Norwegian and UNICEF have conducted three humanitarian aid missions since 2014 to the Central African Republic, to Syrian refugees in Jordan, and to Mali. Together, the partners have brought emergency aid that has saved more than 100,000 children’s lives. Between 2007 and 2016, Norwegian contributed to UNICEF interventions for US $2.5 million. Providing the children of Yemen with nearly 28 tons of essentials medications, water purification tablets and community kits will help UNICEF to ensure a steady flow of supply for the most vulnerable. When a child is sick, every minute counts. In countries beset by violence, displacement, conflict and instability, such in Yemen, children’s most basic means of survival is a priority. The flight departed from Copenhagen yesterday morning heading to Djibouti, which is the closest safe point to bring cargo to Yemen, arriving on Monday night. All the cargo will then be shipped across the Gulf of Aden to Yemen. It is the partners’ fourth – and largest – humanitarian flight to date. As with all previous humanitarian aid flights, Norwegian’s founder and CEO Bjørn Kjos, 71, will lead the mission and actively participate in unloading the cargo. Besides emergency aid, this flight raised close to $25,000 for UNICEF as Norwegian partnered with MegaDo and the global community of frequent flyers, Insideflyer, and auctioned off a number of seats to aviation enthusiasts who joined this exclusive flight. The partners had a similar auction in July for seats onboard the world’s first transatlantic Boeing 737 MAX delivery flight. MegaDo and Insideflyer have now raised close to $50,000 of additional donations for UNICEF.